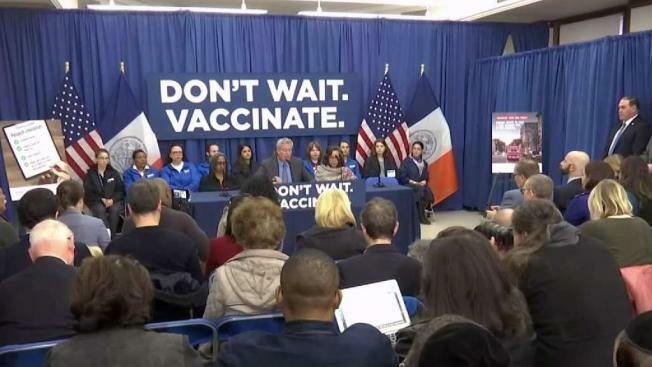 Mayor Bill de Blasio has declared a public health emergency in light of an ongoing measles outbreak in Brooklyn. Andrew Siff reports. New York City Mayor Bill de Blasio declared a public health emergency last Tuesday amid the worst outbreak in New York City since 1991. The declaration came the day after the New York City Health Department ordered all ultra-Orthodox Jewish schools in a neighborhood of Brooklyn to exclude unvaccinated students from classes during the current measles outbreak. The health department previously said that any yeshiva in Williamsburg that does not comply will face fines and possible closure. The emergency order, which will take effect immediately, states that people living in four zip codes in Williamsburg — 11205, 11206, 11211 and 11237 — must get vaccinated or face fines up to $1,000. New York City was not the only location that implemented an emergency order. Rockland County Executive Ed Day enacted a 30-day order on March 26 that banned unvaccinated people under 18 from gathering places including schools, stores and churches. A state judge issued a preliminary injunction against the county's emergency order April 5. Supreme Court Justice Rolf Thorsen ruled in favor of several dozen parents challenging Day's order, part of efforts to stop a measles outbreak that has infected more than 165 people people since October. Civil rights lawyer Michael Sussman called Day's action "arbitrary and capricious." Officials in Rockland County plan to appeal a judge's order that lifted the ban on unvaccinated children in public places. New York Gov. Andrew Cuomo has since weighed in on the measles outbreak saying legislation that would end the ability of parents to object to vaccinations for their children on religious grounds is "legally questionable."